I just purchased a Collins cruiser head online and from handling and looking at it, it appears to be a fairly good axe. My question is what is the common opinion on the Collins cruisers? Are they great, good or fair ? 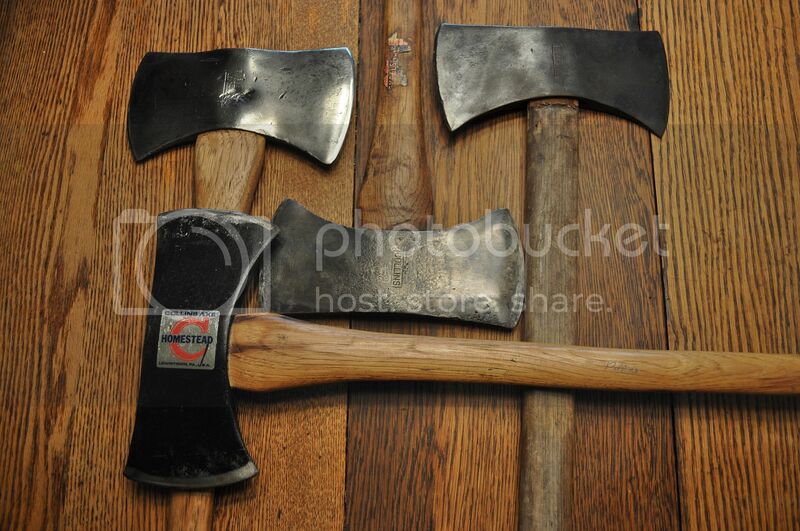 They rate right at the top with any of the other well known, well liked, well made axes, IMO. Vintage Collins are fantastic axes. Here are a couple I had handy, Cruisers are very sought after. Like Creek, I like cruisers. Here are my vintage Collins. Minus the one with the label... I put that one on a 28" octagon helve and gave it to Mike Stewart. Mike had made a custom desert ironwood burl handled F1 for me and it was my way of saying thank you. If the dolts at the Post Office would deliver the handle I ordered, I'd hang it and take a picture for ya'll.